Has anyone ever added a second fuel filter to a diesel engine? There is a tractor dealer I found on line that suggest using two filters would be helpful. No doubt it wouldn't hurt. I was wondering that if anyone has, what type of filter did they use, inline or sediment bowl? Many tractors already have a screen in the tank outlet. I'm not sure I see the reasoning for two filters unless the first was a coarser 'pre-filter' and was only intended to save buying expensive filter elements. If the filters had the same micron rating and element area the first one would plug up as fast as a single one alone and the second one would last indefinitely. Well, maybe there's are other issues I'm not aware of. Maybe increasing the water holding capacity at the bottom of the bowl--something like that. Keeping the tank topped up to reduce condensation probably would work as well. Like most things, filters are imperfect. A filter rated 50 microns only traps a high percentage of particles 50u and larger. So a second filter would help, but not much. Sort of like adding twice as much insulation to a building, the is an improvement, but not a 2 times gain. 2) Use clean ( inside and out ) containers, funnels etc. 4) Avoid fueling outdoors on windy days or in dusty areas. Another product that seems to work well is the Racor filtering funnel (see link). This will filter water out of the fuel as you fill the tank. If you use one of these you should add your moisture dispersal agent directly to the fuel tank before you fill it. If you add the agent to the fuel before pouring it through the funnel it will defeat the purpose of the funnel. My only complaint with this funnel (at least the large one I use) is that it leaves a tiny amount of fuel in the bottom of the funnel. I use a really high-tech method. I use a $2 funnel with a coffe filter clipped inside of it. When I'm done the used filter goes into a fire-proof bucket next to the wood-fired furnace in the shop, they make great fire starters. A box of a 100 costs $1.99 at the grocery store. I figure it will keep the nasty bits out, everything else the filter gets. The thing about the Racor filter is it won't let water through. On the other hand, coffee filters are designed to let water through The racor filter is pretty cool in that regard. You can fill it up with tap water and not a drop comes through, but pour in some diesel and it comes through just fine. Ahh, I just keep the water out of my fuel and empty the seperator frequently. It's easier to keep water out of the fuel after you've bought it than before, and you still have to deal with condensation. I try to keep my tank and fuel cans full to minimize condensation but it's not always possible. At $20 it's cheap insurance, especially if you need a fuel funnel anyway. The generator I just bought has 3 fuel filters. 1 as it comes out of the fuel tank and 2 on the engine. Each have a valve to let water out. Every component has a rate of failure and malfunction and adding any component decreases reliability. It may improve other things and make the increased risks worthwhile. Fuel filters seem pretty benign things so I'm with everybody else. I'd just add one if there's a perceived need and fuel flow remained adequate to support heavy workloads. I still don't understand the logic of several filters except maybe to guard against catastrophic failure of a single filter due to manufacturing defect. That might be a good reason in itself. Filter manufacturers also change their production, materials, QC and tractor manufacturers have to keep up with changes. Another reason might be to guard against having new filter that no longer meets engineering specs until the factory catches up with the changes. In terms of whether additional filters do anything significant in terms of filtering is another question. Filters do pass particles near the size of the filter rating with fair probability but they also block significantly larger particles with probabilities approaching certainty. Without knowing differently, I'd assume that engineers would spec a filter where the filter particle output is insignificant in terms of engine operation. If that's true then subsequent filters are redundant in terms of an engine. Maybe any particle output increases pump and injector wear. 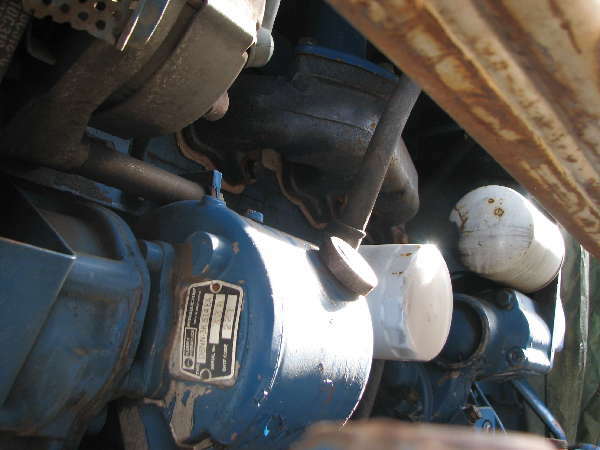 People can expect to replace pumps and injectors during their ownership so that's an issue. Better filtering might increase longevity but only if pumps didn't tend to fail from some other cause first. If they do then additional filters are still redundant. Just questios here. I don't know the answers.